Before I tell you about how you can get your free copy of 6 Best Retail Stocks to Buy in 2018, let me first introduce you to the value investing system that delivers double-digit gains in any market and tell you why you should join today. In a world filled with instant gratification, those of us who are more traditional find ourselves left out of the conversation … and worse, find it difficult to get good investment advice. Of course it doesn’t have to be that way. There are still many investors who appreciate the value of building long-term wealth carefully and steadily—and at least one advisor who understands them. My colleague Azmath Rahiman and his Cabot Benjamin Graham Value Investor advisory are true believers in good old conservative value investing. And no matter what you may have heard recently, value investing is far from dead, despite the pace of our fast-moving economic world. Many people simply lack the discipline and patience it takes to realize the wealth that can be derived from value investing. These people want to get rich quick … score big, dig for gold and strike it rich instantly. They depend on that instant gratification. They hope to make their money on the mistakes other investors make—mistakes that drive short-term market fluctuations. These people aren’t investors, as Benjamin Graham himself explained in 1949. They’re speculators. They’re gamblers. Investors are disciplined, patient and careful. They make money on the true, underlying value of a company—not just the crowd’s current opinion of a stock’s value, which could change in a heartbeat. Investors believe in research, thoughtful analysis of the data and the strength of a company’s actual performance and assets—and buying undervalued stocks that the crowd has overlooked. They rarely make mistakes, and when they do, those small mistakes are always offset by substantial successes. Are You One of These Rare Individuals? 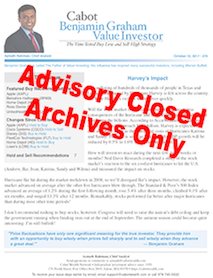 If you are, please read on for more information on how to make patient, rock-steady value investing work for you and your portfolio. It’s not as complex as some people—who simply don’t take the time to understand it—would have you believe. The Cabot Benjamin Graham Value Investor advisory is a worthy successor to Mr. Graham’s renowned technique, and as I said, Research Analyst Azmath Rahiman is a member of a line of the Benjamin Graham method investing family, which includes luminaries such as Warren Buffett, Laurence Tisch, Sir John Templeton and Peter Lynch. Research analyst, Azmath Rahiman, has practiced the Art of Value Creation in many facets over the past decade, developing a following as a value investor in overseas markets, with an emphasis on assisting capital allocators understand the complex Indian markets. Azmath followed the tenets of Warren Buffett in applying his investment advice, seeking middle market companies that are undervalued, possess well-known brands and are led by experienced management. Azmath uses his system to identify the strongest undervalued stocks that are overlooked by investors and have the potential to bring steady returns in any market. Rule # 1 It’s all in the numbers—When you find a company you think might be a good investment, you can’t worry about trends, what’s hot, etc. You must evaluate the business as an asset. The keys to understanding that asset are in the Balance Sheet and Income Statement. We don’t have room in this report to get into an in-depth discussion, and there’s been volumes written about the subject already. Our point here is to help you understand that moving averages, chart trends, etc. are meaningless. The only thing that matters is the intrinsic value of the company. Rule # 2 Look back to look forward—Humans are funny. We can be blind to the most obvious truths, and we can convince ourselves that everything is going to be alright when we’re on a sinking ship. The secret is to assess the financial history of a company in order to determine where it’s going in the future. So if we see a profit margin that is consistently shrinking, consistently rising debt and consistently shrinking top line revenue, we aren’t going to buy that company no matter how low the stock is priced. You have to know the managers’ experience, their track record and their background. This one rule is a bit of science combined with art. It’s not “by the numbers” but it’s essential if you want to get into the best, highest profit positions.That’s all it takes! Simple but Powerful! Take Cabot’s Benjamin Graham Value Investor recommendation to invest in Google, for example. Anyone who followed our recommendation had the opportunity to turn every $5,000 into $16,626, and every $10,000 into $33,253! It has worked over and over again. It helped secure 133.27% on TJX Companies. 107.02% on Disney, and 123% on LKQ Corp.
We’ve seen this formula perform, without fail, for 50 years. Truth is, once you know how to find stocks that fit all three rules, it’s easy to buy the right ones. However, finding those stocks is the hard part that required extensive research and analysis and countless hours of work. You do not need to do this work, however. We do it all for you and present it in one monthly issue. Become a subscriber today and you’ll qualify for our most generous subscription package! 12 months of the best value-based investment advice on Wall Street in Cabot Benjamin Graham Value Investor. Clear, specific Buy instructions. When it’s time to sell, you’ll get a Special Bulletin by email telling you to lock in your profits. New, carefully selected stock recommendations every month that meet Benjamin Graham’s proven criteria. Personal replies to your emailed questions directly from Azmath, not a customer service representative. Independent advice. Since we began offering investment analysis in 1970, we at Cabot strictly refuse to accept any compensation for any stock we recommend. You’re guaranteed to get 100% unbiased direction. Guarantee of Satisfaction. Try the Cabot Benjamin Graham Value Investor for 30 days. If you decide it’s not for you, let us know. We’ll gladly reimburse you for every penny. Plus, you’ll receive our bonus, just-published report, 6 Best Retail Stocks to Buy in 2018 featuring 6 undervalued retail stocks you will profit from in 2018. Some investment advisories charge $200, $500, even $1,000 a year. But you won’t pay $1,000 for Cabot Benjamin Graham Value Investor. Or even half that amount. Subscribe today for a one-year risk-free subscription to Cabot Benjamin Graham Value Letter and get our lowest price. “Thanks very much for the advice. I really appreciate how quickly and thoroughly you have answered each of my emails, and it only adds to the satisfaction I have with the Value Letter. I have told several of my associates about both the letter and your personal replies; you have certainly earned my future business. Thanks again.”—L. Kasuske, Seattle, Washington, U.S.A.
You can continue to settle for mediocre returns … or you can take immediate action now that protects your hard-earned money from the market’s downswings and puts big profits in your pocket using the same system that Warren Buffett has sworn by for more than 40 years. P.S. Don’t forget about our satisfaction guarantee: Try the Cabot Benjamin Graham Value Investor for 30 days. If you decide it’s not for you, let us know. We’ll gladly reimburse you every penny. The issues you received and your free bonus report are yours to keep.